This guide has been prepared as an aid for anyone planning excavation or other earth disturbance activities in West Virginia. It is intended as a reference tool for interacting with the Miss Utility Members through the West Virginia (WV 811) One-Call Center. Neither WV 811 nor its call-center vendor assumes any responsibility for the acts, omissions or conduct of any reader of this guide. This guide is provided solely as a convenience for the person or persons requesting it, and it is not to be used as a legal reference document. Persons seeking a legal reference document should contact their legal representative. WV 811 is here to protect all excavators from hazards while planning to excavate in West Virginia. Prior notification of excavation to allow time for locating of these underground facilities are required by law. Those who choose to ignore the danger by digging blindly or failing to familiarize themselves with damage prevention may be facing legal enforcement and fines. Excavators include those who move the earth with non-mechanical or powered equipment. These excavators may work for city, municipal, county or state government facilities, or contracting companies. Excavators can include landscaping or fence companies, owners of underground facilities and even homeowners. The same requirements apply to contractors or persons who perform demolition activities. We will provide you with a reference number that serves as proof of your call. In addition, WV 811 will keep a complete record of your call to verify your compliance with the law. *NOTE: WV Dig Law does not follow the American Public Works Association or APWA Color Codes for “Irrigation and Slurry Lines”. These lines are marked in “Blue”. The WV 811 web portal may be used to submit online locate requests. Excavators and WV 811 members can access the web portal at https://wvgc.texas811.org/geocall/portal. Homeowners can enter tickets on line at https://wvhop.texas811.org/. The WV 811 call center is open 24 hours a day, 365 days a year and all calls are recorded. Our operators are trained to obtain specific information concerning locate requests. They will enter information into a computer, therefore the order of questions are preset. There is a specific reason for each question that is asked. Caller’s Name – The caller or person making the locate request first and last names are used to maintain a record for all locate requests. Telephone Number – The telephone number (including area code) of the caller is taken in case additional information is required at a later time by WV 811 members. Not Involved Response – WV 811 members must notify callers if they have no facilities at the work site. The caller will be asked if they would like this response or not. If they do, they will be asked how they wish to receive it, which can be by phone, fax or email. Business Mailing Address – The mailing address of the caller company, or person making the locate request. It is possible for the business address and worksite address to be the same if excavation takes place at the same address. Ordinarily this should not to be confused with the excavation site address. Work Date and Time – It is very important not to begin your excavation or demolition work prior to the stated date and time. Notices of not less than two business days and not more than 10 business days, exclusive of Saturdays, Sundays, state & federal holidays are required. County and Town/Community – The county and town/ community (or nearest town) where the work is to be performed. 1. Worksite Address – This is the site where the excavation is to take place. 2. Nearest Intersection or Cross Street/Road – This information helps to pinpoint where the job site is if within a town or city. Also provide distance and direction from intersection. 3. Longitude and Latitude – Longitude and latitude points may be used if known. If readings are obtained from GPS units, make certain the GPS units are performing accurately. All GPS formats are accepted. 4. Length, Direction and Depth of Excavation – This information helps to determine the extent of your work from installing a 2 mile gas line to a single site excavation (i.e. excavating for a basement, drilling a well, etc.) in order to notify buried facility owners. The length of your project can be given in feet, yards or miles. It is important to remember to call two business days before you dig but not more than 10 business days in advance of your dig date. Once the buried facilities are identified and marked by our members, it becomes your responsibility as the excavator to maintain the integrity of the marked facilities. When work is being conducted by excavation equipment, the contractor/excavator must consider maintaining the integrity of the marked buried facilities. Consideration should be given to dividing the work into sections, calling two business days before the start of each section. Direction is given in main compass points (e.g. North, East, Southwest, etc.) from the beginning of the work site. This applies to excavations of length more so than single site excavations. The depth of your excavation helps our members to determine if they may have to provide more than just marking their lines (e.g. determine depth of the lines, have locator on site, etc.). 5. Work Site marked with white – When possible, mark the work site with temporary white marking paint. This will provide the exact location where WV 811 members need to mark their underground facilities. 6. Blasting – The caller will be asked if blasting will occur. 8. Street, Sidewalk, Private Property or Other – If other, the caller will be asked to specify where the work will take place (e.g. road shoulder, highway right-of-way, etc.). 9. For Whom Work is Being Done – The identification of who the work is being performed for is another source for obtaining additional information such as a more definitive location about the project. The customer’s name or property owner’s name is sufficient. 10. Contact Name and Phone Number – The person to contact in case additional information is needed concerning the project. This can be different from the information given for questions 1 and 2. When available, supply alternate contact information. (E.g. mobile phone). 12. Remarks – The caller may wish to give additional information (e.g. driving instructions, land marks, meeting requests, etc.) pertaining to the locate request. Detailed information of exact excavation site is particularly helpful. 13. Members Notified – Identity of WV 811 members notified will be provided to the caller. 14. Ticket Number – An identification number associated with the call for future reference if needed. *Provide as much detailed information as possible with questions 7 through 12. This information is used to determine which members will be notified for your work site. The Web Portal may be used to submit Web Entry (E-Tickets) tickets, process your own update & remark tickets or conduct a ticket search. Logins for the previous E-Ticket and Ticket Search features will not work for the Web Portal. You must register with the site to gain access to the Web Portal. Attention Positive Response Users: If you already have a login to use the Positive Response features please do not use the auto signup feature to register for the Ticket Search and Web Entry features, as it will create an additional user account and not update your current account. If you already use Positive Response and would like access to the Ticket Search and Web Entry features please contact RemoteApps@Texas811.org. The Web Portal is designed to work with Mozilla Firefox, Google Chrome and Microsoft Internet Explorer 8, 9 and 10. Other browsers, including versions of Internet Explorer prior to 8, are not compatible with some of the new functions and features. The West Virginia 811 mobile app offers fast and easy access to many resources for facility operators, excavators and homeowners directly from a smart phone. Submit, update or view a dig site map of a Locate Request and check the status or submit a Positive Response. Access information about West Virginia 811 news and events and the West Virginia State Laws. The app is free and can be uploaded to your mobile device from the App Store or Android Apps on Google Play. Not all facility operators in the State of WV are members of WV 811 and may not follow the requirements of the WV One Call Law. 1. Remember, facility operators will only mark out facilities for which they are responsible. 2. Facility operators under the WV One Call Law are required to mark their facilities and/or notify the excavator if they are clear. As an excavator, ultimately you are responsible for making sure each facility operator on your ticket has responded. 3. Under WV Law, a facility operator has up to two business days to mark their facilities. 4. If you do not hear or see evidence of a response from a facility operator identified on your location request before your stated commencement date, call the facility operator’s contact number. We do not recommend beginning excavation until you are sure that each facility operator has responded to the locate request. However, by law, you may proceed at your own risk. You will not be exempt from damages resulting from your excavation. If you do not have the contact number, please call WV 811. 5. You can verify your responses and contact information for your ticket at https://wvgc.texas811.org/geocall/portal/. Click on “Find Tickets” and enter your ticket number to search for a ticket number. 6. It is important that you provide accurate field contact numbers when you submit your locate request; this is the number facility operators will call if they need to contact you regarding your location request. Use white marking products (paint, flags, stakes, or combination) to identify the excavation site. When painting, mark the proposed area of excavation by using: a continuous line, dots marking a radius or arc, dashes marking the four corners of a project, or dashes outlining the excavation project. Marks are about 6” to 12” in length and 1” in width. Space them about 4’ to 5’ apart. Make the marks close together enough to be seen by the buried facility owner’s locators. Dots should be about 1” in diameter and are typically used to define arcs or radii and placed at closer intervals than dashes. When an excavation site is contained within a 50’ radius, or less, you can mark it with a single stake positioned at the center of the proposed excavation. If you choose this way of marking, you must tell WV 811 you have marked the excavation site with a single stake at the center and include the radius of the site. The stake has to be white and have the following information on it: excavator’s name, abbreviations, or initials, and the radius of the excavation site in black letters on the stake or a note attached to the stake. For more information and suggestions for marking a proposed excavation site see the current Common Ground Alliance (CGA) Best Practices for complete details (www.commongroundalliance.com). NOTE: Under WV Dig Law “Emergency” means: (1) A condition constituting a clear and present danger to life, health or property by reason of escaping toxic, corrosive or explosive product oil or oil-gas or natural gas hydrocarbon product, exposed wires or other breaks or defects in an underground facility; or (2) A condition that requires an immediate correction to assure continuity of service provided by or through an underground facility. Notification of proposed excavation, demolition, or any other earth disturbing activities are required to be placed to WV 811 not less than 48 business hours before any such work is to begin. A notification shall not be made more than 10 business working days in advance of the beginning of any such work due to the possible deterioration of the locate markings. Failure to make the required notification may result in a misdemeanor and up to $5,000.00 in fines. The time requirements are exclusive of Saturdays, Sundays and legal holidays. Excavators are reminded not to begin excavation until all underground facilities have been marked, including those that might be operated by a facility owner not having membership in WV 811, and therefore, not notified of the excavation by WV 811. WV 811 must also be notified, as soon as reasonably practical of excavations necessary to address an emergency. Facility owners will mark their facilities at the site as soon as practical. Extreme care must be taken to avoid damaging other underground facilities that may be in the area since excavation activity during emergency conditions normally begins before adequate time has been allowed for locating and marking of other facilities. Invalid Emergency Ticket – If an excavator requests an emergency ticket, and excavator personnel are not onsite when the locator responds, it is considered an invalid emergency ticket. Utilities involved may bill the excavator to recover the cost of processing and responding to an invalid ticket. 1. Before you begin any non-emergency excavation you must call WV 811 and make a locate request, at least two business days but not more than 10 working days, before your excavation begins (not including the date of your call). 2. Do not start excavating before your stated commencement date and time! 3. Weekends and holidays are not working days and are not counted in the two to 10 days between the date of your location request and your commencement date (See holidays below). 4. If your excavation has not started within 10 working days of the stated commencement date, your location request will no longer be valid, and a new location request is necessary. 5. If the excavation work is completely cancelled, that must be reported to WV 811. 6. Once excavation has begun, the location request is good for the life of the excavation; however, if markers, stakes, and other designations used to identify the location of underground facilities are not protected and preserved, a new location request is necessary. Note: When Christmas Day and New Year’s Day fall on Tuesday, Wednesday, Thursday, or Friday, the preceding half day on Christmas Eve (December 24) and New Year’s Eve (December 31) are observed as a holiday. When a holiday falls on a Saturday, the previous Friday is observed; when a holiday falls on a Sunday, the following Monday is observed. For more information on tolerance zones see the current Common Ground Alliance (CGA) Best Practices for complete details (www.commongroundalliance.com). 1. You, as an excavator are responsible for preserving the marks set down by facility owner/operators at your site. 2. Before you begin your excavation or demolition, walk through the site to familiarize yourself with the markings and the locations of buried facilities. It is a good practice to photograph, videotape or make a sketch of the marks. 3. Pay special attention to any changes in the direction of the underground facilities. 4. If your excavation or demolition will cause the removal or disturbance of markings, establish offset marks in order to maintain a reference point for those underground facilities. 5. Make sure everyone involved in your excavation or demolition is aware of any established offsets, any compromised marks, or any other information regarding facility locations. 6. Don’t put spoil piles over markings. Avoid driving machinery over stakes and flags. Paved areas should be swept periodically so painted marks remain visible. 7. If marks have faded or been compromised to the point where proper and safe excavation or demolition is no longer possible, call WV 811 to make a request for a re-mark. 8. If your project is interrupted for more than 10 working days, call WV 811 and make a request for a re-mark. 9. Once the project is complete, it is recommended you remove any marks as best you can. This will reduce the likelihood future excavators will mistake them for marks provided in response to their own excavation notice, or assume they do not need to provide notice of intent to excavate. 1. Facility lines must be indicated by markings usingcurrent APWA uniform color codes*. Markings should be 12” to 18” in length and 1” wide. 2. The owner of a facility should be indicated by initials or by name in letters 6” high at the beginning and end of the locate. On long locates, the facility owner should be indicated every 100’. *Refer to Guidelines for Marking Section on page 12. 3. For operators with multiple facilities within an excavation area, for example bundled or stacked facilities, the total number of lines within the ground should be indicated when known. 4. If a facility is known to be present but the total number of lines for a facility cannot be determined, a corridor marker may be used indicating the approximate width of the facility. 5. When known, the size of the line being located should be indicated. Line size should indicate the outside diameter of the pipe or structure. 6. Conduit or duct structures, whether single or multiple conduits or ducts, should indicate the approximate depth of the structure. 7. When known, the pressure of a gas facility should be indicated. 8. When known, termination points, dead ends and stub outs should be indicated. 9. Offset markings should be used when there is a strong likelihood that marks may be destroyed, (if placed directly over the facility). Verify the location, type, size, direction-of-run and depth of the facility. For natural gas and liquid petroleum lines, verification must be by means of hand-dug test holes. The location of other facilities must also be verified by means of hand-dug test holes unless otherwise agreed upon with the facility operator. 2. Do not assume that buried facilities will be at a certain depth. Facilities may have been originally installed at a prescribed depth, but later erosion or grade changes cause them to now have shallow or deep cover. Refer to Guidelines for Marking Section. 3. Verification by a hand-dug test hole requires the facility to be exposed to view. If after a diligent search the facility cannot be verified in this manner, notify the facility operator, or your One-Call Center (do not assume clearance). 4. Vacuum excavation is an accepted means of verifying the location of marked facilities. 5. Powered equipment may be used for removing pavement, but only to the depth of the pavement. Care and good judgment should be used when removing pavement. Avoid starting the pavement break directly over the marked facility. Wherever possible, start a few feet away from the marks and attempt to “peel” off the pavement or break it into small chunks for removal. 6. Verify the location of facilities before you excavate up to the edge of the tolerance zone. It is a good practice to assign workers to do the facility verifications ahead of the excavating crew. You’ll be providing a greater margin of safety and any problems can be resolved in time to minimize interference with the excavation. 7. If the excavation is going to cross a tolerance zone, dig a test hole to expose the facility at the point of crossing. 8. 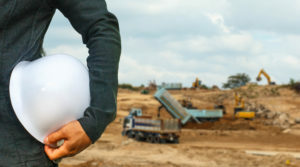 If your excavation is going to parallel a facility, you should dig test holes at any marked change of direction, elevation and at branch connection. 9. For relatively straight excavations parallel to a facility, a test-hole should be dug approximately every 20 to 25 feet or as requested by the facility operator. 10. If you find an unmarked or unknown facility, and you can tell who the facility owner is, notify them. Otherwise, notify the One-Call Center. For more information on digging safely around underground facilities see the current Common Ground Alliance (CGA) Best Practices for complete details (www.commongroundalliance.com).